Warning: This is by no means an easy build to achieve or master. It will be very tough early on, especially in Cruel and Ruthless. Be prepared to die alot of times if this is your first try with a shadow. I strongly discourage you from building it in HC until or unless you have very good ES gear stashed up. If this is your first time playing, my advice is to steer clear from this build, it is not easy! Should I level my gems? 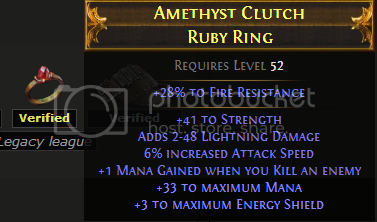 Aura gems should always be leveled, Clarity should not be leveled past 3. Curse gems should not be leveled at all. 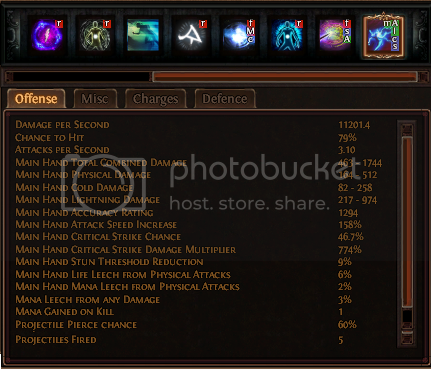 Lightning Strike should not be leveled past 9 initially. As a rule, when in doubt, check the wikipedia to make sure your stats can actually support the gems before leveling it up. Everything else can and should be leveled. Does this build require OP gear to succeed? You don’t need OP gear to succeed, although you will need very good ES gear to survive. However, the better your gear, the more fun you’ll have, but that’s no different from other builds. In a nutshell, Claws provide higher %lifesteal and hence increased survivability but overall lower critical chance and DPS. 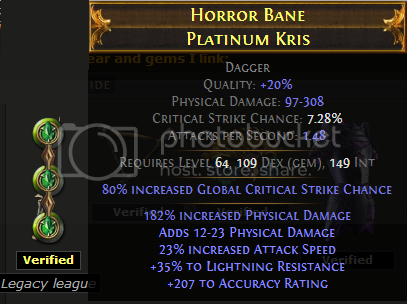 Daggers on the other hand do not provide %lifesteal but make up for it with an overall higher critical chance and DPS. 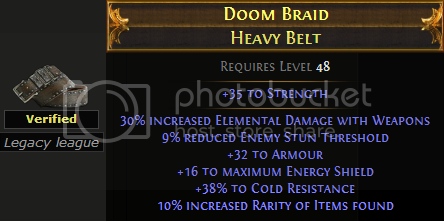 What is this build about? It’s a build that focuses on building the shadow around a CI build, focusing mainly on high crit chance/crit multiplier with Surgeon’s Granite Flasks, Energy Shield, Evasion, and ES Steal while using Lightning Strike as the AOE CC skill, Viper Strike/Elemental Hit/Double Strike as the main dps skill in 1v1 bosses/pvp situations and Flicker Strike as a high DPS spam skill when needed. 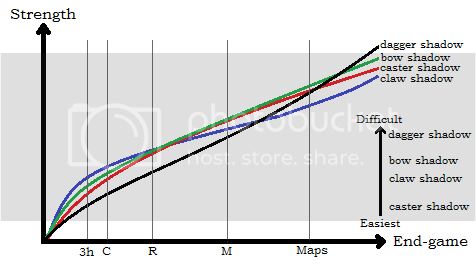 DPS-wise it leans heavily on criticals and hence revolves around a high crit-chance and high crit damage multiplier build for dealing damage while taking advantage of the crits to recharge granite flasks quickly. Level 68 Maze Rare Map Run – Double Vaal Boss! 2. Might find it a bit difficult-going mana wise, but that is in turn countered by the Mind Drinker node and Warlord’s Mark curse. Note: These gear was crafted in closed beta before the wipe. That amount of ES on the chestpiece and shield will no longer be attainable within 2 prefixes. Everything else should still be attainable. Using the Granite Flasks constantly will keep you either at >40% damage reduction and as they recharge one charge everytime you deal a crit strike, feel free to use them generously!In short, you become a high DPS ES/Evasion/Armoured Tank! Grace/Haste, Wrath, Discipline and Hatred. Grace and Discipline for survivability. Wrath and Hatred for added DPS. Grace can be replaced with Haste later on for more DPS, but only after you’ve specced into CI and have already taken Vaal Pact. Need I say more? You’re CI, this skill is what makes you awesome! Switch it on, kill a few mobs, watch the frenzy charges pile up, get the bonus ES steal and be even more awesome! Warlord’s Mark is the curse of choice. 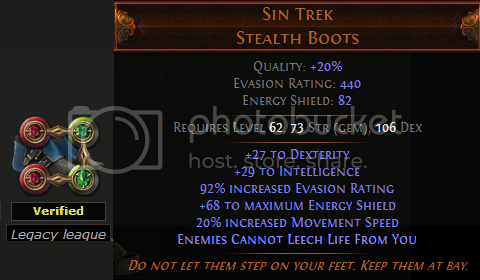 It’ll grant you extra %Life leech and %Mana leech to sustain both your ES and Mana. It also gives a percentage chance of granting an Endurance Charge per enemy you kill, helping your survivabilty as well. – if it is heavy in terms of mana usage, throwing in a mana leech will always help! Viper Strike. Best early-game and arguably mid-game skill when you’re still weak and need to kite bosses to stay alive. 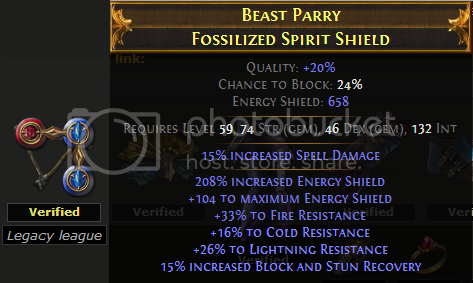 Also a super useful skill for elemental resist rares and bosses like Vaal where you’re constantly trying to avoid their high elemental damage skills. – If you get bored of owning mobs with LS and want to give yourself a mild headache, top up your frenzy charges and let loose with flicker spam! 0 cd with your charges up and if you get to KO enemies with 1 hit, which is often the case as you crit often, your frenzy charge recharges and you get to flicker more. My flicker usually lasts on average 8 times before exhausting all my charges. The difficult part of this build is actually being able to progress through the earlier levels. If you can get through that you’ll do fine. In this section I will attempt to outline the early game gameplay of this build. Focus on gear that gives you +life, namely leather belts with +life and rings/ammys with +life. At this stage, ES gear is weak, so I would recommend you to stack Armour, resistances and HP to improve your survivability. Main objective here is to survive till late game where you can get good ES gear. Weapon-wise, don’t be picky. Get anything that gives you higher DPS, although it would be better if you focus on Claws/Swords/Daggers for the purpose of allowing you to use Whirling Blades as well as Viper Strike. There is no need to single-mindedly specialise into daggers so early in the game and if you notice, I did not spec points into dagger nodes early on as well. The first HP Flask for me is always a panicked flask. 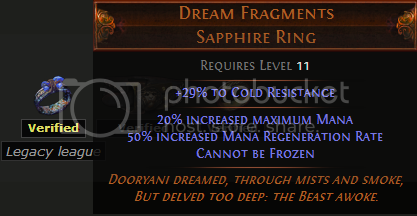 For the rest of my flasks I tend to prefer useful mods such as Dispel Frozen and Chilled. You will not be getting Lightning Strike as a quest gem till somewhat later in the game. If you want it earlier, you can always level a templar till level 10, kill Brutus, get it as a quest gem and then transfer it to your stash for usage by your shadow or simply trade for it from another player. Fire Trap when used in combination with a weapon AoE would also be a good option. Freezing Pulse + LMP is also a very good option (my favourite option) that can last you all the way till Cruel Act3 too. If you’re using a claw, Whirling Blades will be the best AoE for you early on in the game. From normal all the way to end cruel, dual wield weapons and use Dual Strike. The DPS benefit which allows you to speedrun through the earlier levels much faster far outweighs the paltry defensive bonuses provided by the low level shields. However, make sure you keep a Viper Strike gem socketed and continue to level it. You will need it once you switch to 1h + Shield. Summon Skeletons. Especially useful against flicker mobs and Kraitlyn as it gives them an additional target to flicker to and spares you the agony of being spam flickered to death. Spell Totem + Summon Skeletons will be your best friend. This spell summons a totem which will summon skeletons around enemy monsters, thus shifting aggro away from you. Temporal Chains/Enfeeble early on in the game if you need survivability. This is pretty much the same in most AARPGs. You will be very weak early on. Your key to defeating the bosses will be to kite them. Viper Strike them to 4 charges, switch to Dual Strike, then escape to recharge HP/ES when you get low, then repeat cycle till they die. When do I respec to CI? Merciless Act 2. No sooner than that. More specific instructions below:When you reach Merciless Act 2, the first place you should head to is Fellshrine. Don’t bother doing any quests at this point in time. All you should be doing is grinding at Fellshrine, leveling and farming for gear. Don’t bother progressing in quests until after you’ve respecced into CI. After you’ve respecced into CI, you want at least 3.3k ES in order to complete Act 2 relatively smoothly. 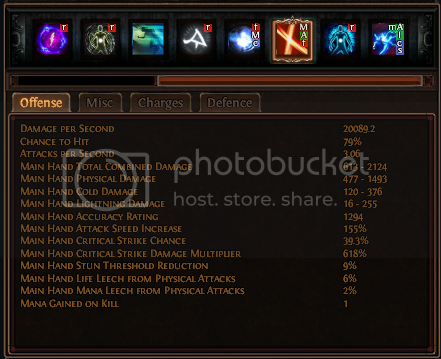 Attention: Even with 3k ES, Vaal can still one-shot you with his melee attack, so remain alert when fighting him! Avoid Causic Mana Flasks! They will kill you because you have only 1 HpPuncture mobs are your worst enemy! If you’re punctured, stop running! (If you run you will take more damage) Stand still, switch on a Granite, tank them and kill them. Avoid getting trapped in large packs as they’ll stunlock you to death. Also be wary of archers, keep moving or else they’ll stunlock you to death as well. 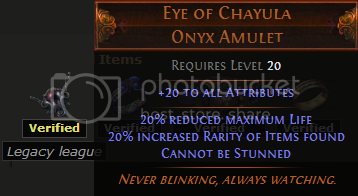 Lastly, don’t bother going into maps until you have the Eye of Chayula unique ammy. 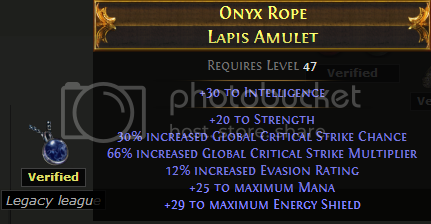 Amulet: Eye of Chayula is the best, failing which an ammy with +ES will doRings: Dream Fragments is a must. 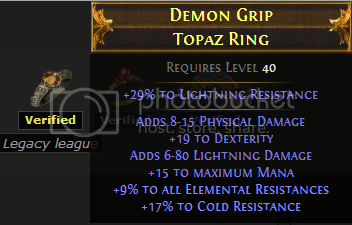 For the other ring, choose in order of descending priority: +Mana, Increased Attack Speed, +Lightning Damage. Because 1 pure ES and 1 pure Evasion will always yield better defensive stats as compared to 2 Hybrid pieces and are easier to craft/find. Why that 1 Hybrid piece then? 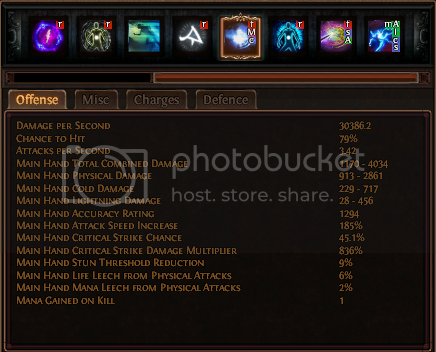 Because if you noticed how I link my Flicker Strike, I need 2 Reds, 1 Green and 1 Blue socket. 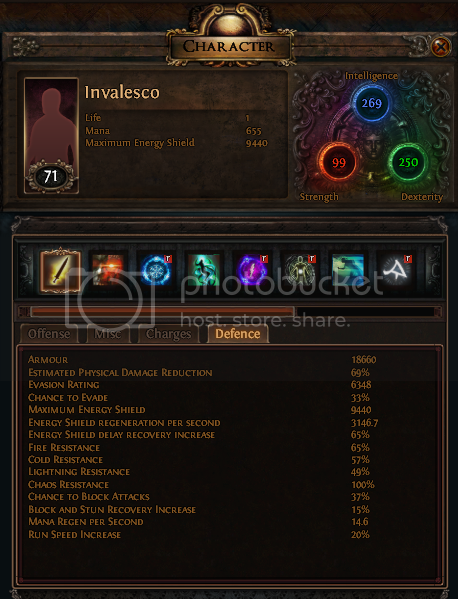 Pure Evasion pieces have a higher chance to roll Green sockets, ES – Blue sockets and Armour – Red sockets. 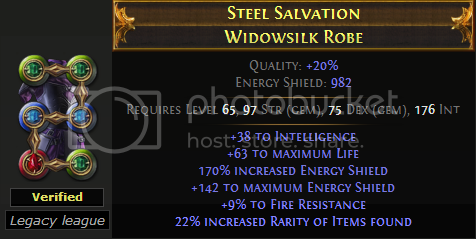 It is nearly impossible (or just damn expensive) to roll 2R 1G and 1B on a pure Evasion or pure ES gear and resorting to using a pure Armour piece for that wouldn’t be worth it. However, Hybrid gears have a higher chance of rolling all the different combination of colours, hence my reason for using at least 1 piece of hybrid gear. as with most builds, having great gear is key to success. Even more so in this build as having great gear will amplify exponentially the fun you will have with it. Trading for better pieces of gear will be your main source. However, there will come a point when you realise that you can no longer get better gear through trading, and that is where crafting comes in, as explained in the next section.